With a fantastic ride and superb steering, your driving experience will be raised to the next level. As a premium tire fitted out with new technologies for the best SUV driving experience, NFera RU1 provides superb handling and grip. 4G optimized compound technology delivers an optimized tread grip on both wet and dry surfaces. Improved block stiffness and balanced constuction provides excellent handling and steering stability. Special tread compound, flexible sidewall and optimized asymmetric pattern design delivers a refreshing ride comfort and long mileage. Three wide grooves on the in-side part that wields great influence upon the driving performance in the rain are applied to improve hydro/wet performance. One narrow groove on out-side is applied to increase the block stiffness and thereby improve handling and steering stability during cornering. Optimized out/in rib balance delivers the best stability during high-speed driving. Silent sipes disperse noise from high stiffness block and consequently, have a very low noise output. N'Fera RU1's excellent wet braking performance is achieved with POS & HES technology. Optimal contact patch on road surface is realized by POS & FOS technology delivering best-in-class dry handling performance. POS: Tire Profile Optimization System. Bought these to replace the OEM Goodyear wranglers as they were avalaible, price and reviews were good, and the Goodyear’s wear wasn’t up to scratch in my opinion. They didn’t transform the handling of the car, but it’s a 7 seat giant of a SUV and so not too sporty in the corners anyway. The grip in both dry and wet wasn’t significantly worse than the Goodyear’s, and probably a little better in all but dry conditions. Had a few days use on snow / ice on treated and untreated roads, and combined with the electric wizardry of the Discovery, seemed to cope a lot better than the 1.8mm Goodyear’s i’d Just taken off. Whether the reed depth made more of an impact than brand i’m Not entirely sure. Seem to be lasting well after 12,000m I certainly would buy them again. I was a little worried about purchasing tyres from the internet at first, however mytyre were very professional and delivery was prompt, however I recommend you check your tyres carefully on delivery as one of my tyres was the wrong size, however it was rectified promptly. Although I paid for fitting which usually costs around £10 to £15 a tyre I still saved £180. 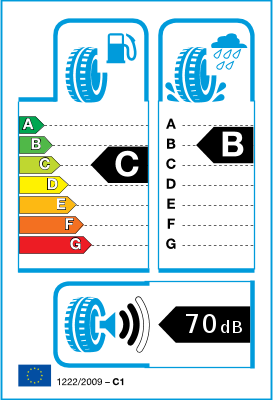 The tyres were deliverd packaged and looked great, the EU standard efficiency marking was very helpful in choosing the tyres, I had great tyres and great service from Mytyre.